The University of Texas System Board of Regents voted unanimously at their Feb. 13 meeting to recognize the "leadership and generous support" of ICES Founding Director and ASE/EM Professor J. Tinsley Oden. In his honor, the Institute will be renamed the Oden Institute for Computational Engineering and Sciences. "As members of ICES, past and present, each one of us has been personally touched by Dr. Oden's vision, passion, leadership, and dedication. I could not be prouder to be the director of the Oden Institute," said Karen Willcox, who was selected to direct the Institute when Tinsley Oden stepped back into full time research in 2018. "Dr. Oden, and what became ICES, defined the new discipline of computational engineering and science in an unparalleled way. ICES is THE world leader in its field. It is the absolute best," said UT President Greg Fenves when requesting the change from UT System's Board of Regents. "The person who fostered that culture of excellence more than anyone else, is Dr. Oden. With his recent decision to step down as director, I can think of no better way for UT Austin to honor his accomplishments and all that he has done for the university, than to name the institute he established and built to be the very best, for him." Oden’s dedication to building a research institute for computational sciences on the UT campus began in 1973 when he arrived at UT. The same year he was hired as a UT professor in the Department of Aerospace Engineering and Engineering Mechanics, he started the Texas Institute for Computational Mechanics (TICOM), a research group for UT faculty and students. 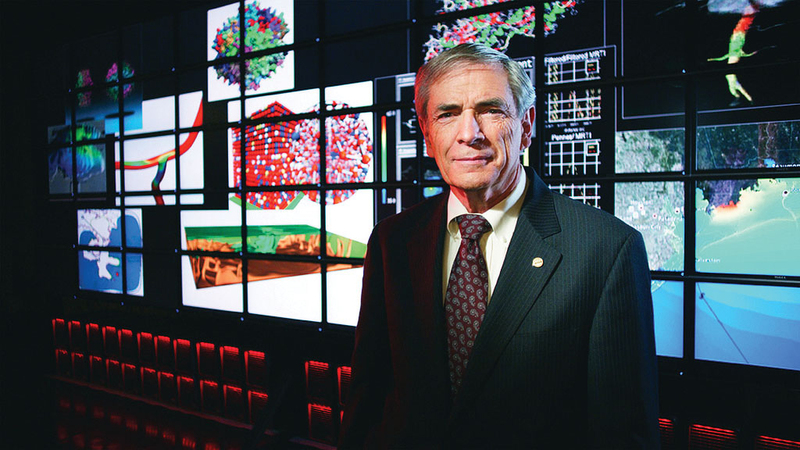 Oden’s ability to demonstrate the power and potential of computational science helped attract the funding and research expertise that transformed a small, interdisciplinary research group into what is now a world-renown research institute. A prolific writer and researcher, Oden is an author of more than 600 scientific publications. His treatise, Finite Elements of Nonlinear Continua, published in 1972 and subsequently translated into Russian, Chinese, and Japanese, is cited as having not only demonstrated the great potential of computational methods for producing quantitative realizations of the most complex theories of physical behavior of materials and mechanical systems, but also established computational mechanics as a new intellectually rich discipline that was built upon deep concepts in mathematics, computer sciences, physics, and mechanics. Computational Mechanics has since become a fundamentally important discipline throughout the world, taught in every major university, and the subject of continued research and intellectual activity. Oden has published extensively in this field and in related areas over the last three decades. Oden provided the vision for ICES as a scientific research institute. But building it wouldn’t have been possible without support from UT administration and donors, most importantly Peter O’Donnell, Jr., the philanthropist and founder of the O’Donnell Foundation, which has given approximately $143 million to ICES and the research institute that preceded it.